The way we work is changing – and changing rapidly. Some recent research was reported that apparently only 6% of people now work a regular 9-5. Now, these could be skewed statistics where it turns out the clear majority are working regular hours, but it happens to be 9-5:30 or 8:30-5…but it’s likely that even with skewed statistics this reflects the vast sea change in the way we work. Patterns established for Victorian industry aren’t relevant anymore in a digital world. Being in a specific place at a particular time to do many tasks is an anachronism that plenty of us could do without, and we want to explore and enjoy this new way of working. The freedom and flexibility from what’s been dubbed the fourth industrial revolution is like any freedom, push it to its limits, and it’s not as much fun as it might at first seem. For example, loneliness, lack of collaboration, not being able to access all the good stuff you would if commuting to a “Central Business District” – this has led to people flocking to coffee shops, finding a place and people to work with. Shuffle this idea along a bit and throw in a good dose of the sharing economy coming of age and the coworking space is born. As a history of coworking, this is a terrible injustice to what is becoming a massive movement. Let’s move on to why coworking is important for our city. Geographers have established theories of how a city or a region develops in line with its economy, cluster theory. Companies that are innovating or driving forwards tend to group together – think Silicon Valley, City of London, creative clusters in areas like Shore Ditch, closer to home we’ve the Barras, Pacific Quay and so on. Now some of this is artificial, but a lot of it is because companies recognise the value of proximity and the natural sparks of information transfer, talent and collaboration that this brings. At a micro-level coworking allows the same thing to happen. It needn’t be industry or sector specific, but people find that proximity to other people creates that place of exchange. Even if sometimes that exchange is just presence! In a changing economy and workplace, we need places that allow those relationships and collaborations to happen. Humans have never flourished in isolation, we’re communal creatures, and more importantly than clustering for the sake of economy we’re clustering for the sake of meeting that human need for community. As people work more flexibly, in time and place, coworking spaces, collaborative coffee shops, third spaces, all become critical to the wellbeing of our city. If all these people disappeared to the fringes, they take away the vibrancy that they bring to the city centre – not to mention the money they might spend. 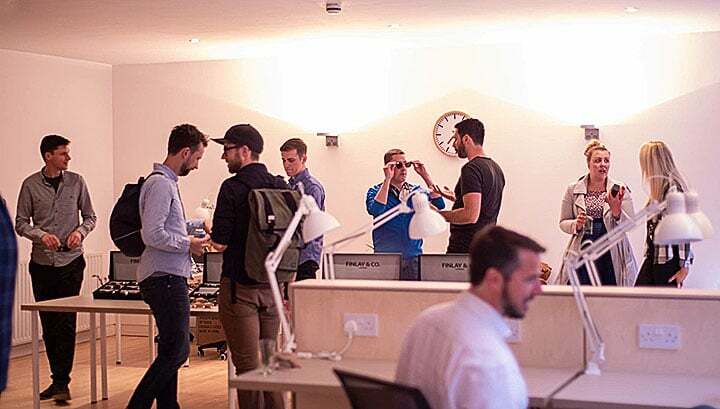 Having an infrastructure in the city of third places – coworking, collab spaces, whatever your thing is – is critical to ongoing vibrancy throughout this sea change in how we work. Not just for the good of the city centre, but for the good of the work we do, and for the good of ourselves. Iain is an urban planner and the founder/operator of the Reorient coworking space in Cowcaddens which opened in May 2018.